The full moon of July, in its radiant perfection, is dedicated to the Guru. As the Gurupurnima moon arcs silently across the sky, Siddha Yogis around the world will pause to remember what a wonder, what extraordinary good fortune it is to have a Siddha Guru—a perfected Master—in this world! Perhaps the sky will be clear, and you will be able to behold the Guru’s moon as it blesses our world with its soothing rays. Or perhaps you will find it temporarily obscured by a blanket of clouds. You may be in a part of the world where the lunar eclipse will be visible. Whether you see the moon or not, you can trust that it is present. As we contemplate the Gurupurnima moon, we can marvel once again at the infinite compassion and generosity of our beloved Guru, Gurumayi Chidvilasananda. For just as the full moon illumines the night sky, so the Guru lights this world with her divine love. Throughout the ages, the saints and sages of India have made one thing clear: to truly know God, to experience the effulgent light within your own being, you need a Guru to guide you. Only one who embodies the light of the Truth can reveal it to you and guide you to become established in that Truth. Gururupāyaḥ. The Guru is the means. We see the perfect expression of this sutra in Gurumayi’s bestowal of shaktipat, the awakening of our spiritual power. Through her bestowal of shaktipat initiation, Gurumayi grants us the means to become established in the experience of our blissful inner Self. Gurumayi’s compassion is such that she has given—and continues to give—shaktipat initiation to thousands of seekers around the world. This rare gift has awesome implications—for it is through shaktipat that the Guru manifests as the awakened shakti within our very being. a great union takes place. Gurumayi’s words give us an indication as to just how momentous this is. In this sacred moment of shaktipat, the experience of which can be dramatic, or very subtle, an extraordinary bond is forged between Guru and disciple—born out of the Guru’s love and sustained by the disciple’s own sincere effort. This bond is a blazing light that illumines the inner firmament of our being. We nurture this light by embracing the practical means that the Guru gives us to unfold the power she has awakened within us. Gurumayi’s teachings, the mantra, the spiritual practices—all of these means, these methods, carry the shakti, the grace-bestowing power that reveals the light of true knowledge. As we follow the path she shows us, we experience the Guru as our inner companion and ever-present guide, leading us step by step to becoming established in the awareness of the Self. When I received the gift of shaktipat initiation, I was fifteen years old. In that moment, a subtle inner relationship began. I discovered that each time I remembered Gurumayi, or repeated the mantra, or simply became aware of the breath, I could feel my Guru with me. I would experience her presence in different ways: as joyfulness, inner conviction, unconditional love. I knew this experience wasn’t a mental fabrication; it was as real to me as the ground on which I stood. Gurumayi’s teachings have been a lodestar in my life ever since. For example, if ever I feel my engagement with the practices is becoming a bit perfunctory, I know that all I need to do is turn to the Guru’s words. Reading and reflecting on Gurumayi’s teachings has a guaranteed effect, connecting me to my own enthusiasm for sadhana and reminding me of my spiritual goal. This year, Siddha Yogis throughout the world are studying Gurumayi’s Message, Satsang. The company of the Truth. 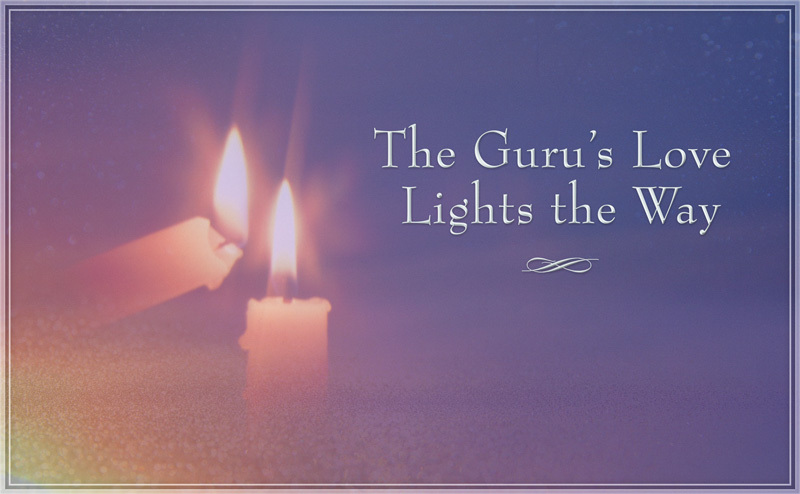 When we put Gurumayi’s Message into practice and connect to the Truth at the heart of our being, we open to the Guru’s grace-bestowing power in that moment. This may be accomplished, for example, by simply remembering the light within as we brush our teeth, connecting with the heart as we listen to a colleague, or observing the breath as we wait at the traffic lights. In this way, we can turn every mundane action into a miracle of connection. Over time, as we continue to do this, we come to realize that indeed, there is never a time when the Guru is not with us. Having attained oneness with divine Consciousness, the Guru is not bound by time or space. Recently in meditation, I had a vision of myself as a small child, sitting at the kitchen table. I realized this was an early memory I had not recalled before. As I observed the scene, to my astonishment, Gurumayi walked into the kitchen, knelt down and gave ‘little me’ a big hug. I could feel her love, vast and tender, and was deeply moved. In that moment, I realized that my Guru’s love and protection was present in my life long before I ever knew she existed! As I look back over my life with this new insight, I am recognizing many other instances in which the Guru’s loving protection has been with me. Steadily, I am coming to understand more deeply that it has always been there. Every teaching that Gurumayi gives, every gesture, every action, is born out of her love. And as we walk the path she shows us, we can experience the depth of this love more and more. Finally, we recognize that this love has been ours all along—that in fact, the Guru’s love and the love we experience in our own awakened hearts is one and the same—and we are able to share that love with everyone around us. 1Shiva Sutra 2.6; Swami Muktananda, Nothing Exists That Is Not Siva (South Fallsburg, NY: SYDA Foundation, 1997) p. 33. 2Swami Chidvilasananda, The Magic of the Heart (South Fallsburg, NY: SYDA Foundation, 1996) p. 123. Padmini Wijetunge began her study of the Siddha Yoga teachings in April 1990 at the Siddha Yoga Meditation Center in Virginia Water, England. 1996, offered seva in Australia and New Zealand for Gurumayi’s teaching visit in 1997, and served in Gurudev Siddha Peeth as department head for the switchboard in 1998. Padmini has also offered seva on the European Overview team from 1998 to 1999; on the Live Events Team in the Siddha Yoga Meditation Center in London from 2000 to 2002; and as secretary to the UK National Steering Committee during 2003. She currently offers seva as a writer, editor, and reviewer with the SYDA Foundation Content Department from her home in Bath, England, where she lives with her husband and their two children. 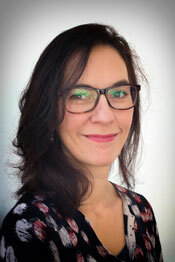 She is professional copy editor with a BA in English literature from Cambridge University. As I pause and allow the moon to whisper to my wonder-filled eyes, I ask myself, “What has she whispered? What message does she have for me?”. The answer comes, and while it may be unintelligible to the mind, this is of no matter to the Heart, which understands perfectly, and overflows with gratitude for the Supreme. I read this beautiful essay as the Gurupurnima moon began to rise. As the moon came into view through the trees, I paused to reflect on the multitude of blessings and grace I have received in my 30 years on the Siddha Yoga path. As the cooling light of the full moon illumined this clear summer night, I realized that because of the love of my Sadguru, she is in my heart and with me always. I loved this article very much! I felt it articulates my personal experience. Since I was 11 years old, I have experienced how the Guru’s love and companionship have manifested in so many ways. As years go by, I can only experience more and more love and deep gratitude for the existence of Shri Guru. It is an honor to be part of this mystical and ancient tradition as it is celebrated on the Siddha Yoga path. Thank you, Gurumayi, for your never-ending love, guidance, and protection! My life is blessed by the infinite grace you shower on us through your teachings, poems, artwork, photos, talks, music, and words of guidance. My life and the life of thousands are truly uplifted by your existence. Thank you, thank you, and a thousand times, thank you! I love to read about the bestowal of shaktipat, for it rekindles my own experience of that indescribable initiation. When I read Gurumayi’s words saying that “Seers have tried to describe it by saying it is like a thousand suns blazing simultaneously across the inner sky,” I had an “aha moment.” I remembered a dream I had shortly after receiving shaktipat three decades ago. I had entered a darkened room and turned on the light. Leaving the room, I went to switch the light off, but the light would not go off. No matter how much I tried, it would not go off! As I thought about the writer’s realization that her Guru’s love and protection had been with her long before she knew the Guru existed, I had a similar recognition—that the Guru has always been with me. But I needed that “switch” to be turned on, and that switch was my shaktipat initiation. This contemplation has deepened my trust in the Guru immensely. Guided by Gurumayi's Message for this year, I have felt a fresh sense of wonder as I watch the moon grow toward the perfect expression of Gurupurnima. Throughout this year, like Padmini, I have relished sweet moments of connection. They have become more plentiful, and I have found myself diving more deeply within during those moments of satsang. And now, this month, I have found that the moon and her light have carried me further into a place of vibrant silence and joy. Standing at night, looking up at her and opening myself to her light, I feel I am entering the presence of Shri Guru. In these moments of satsang I know that, like the herbs that grow in the moonlight, I too am growing. And, I am buoyed by this state of vibrant satsang many times during the day. Jaya Gurumayi! I am so grateful.